The Samuel Dixon Family Health Centers’ annual Rubber Ducky Festival will be held Saturday, Oct. 27, from 11 a.m. to 3 p.m. at Bridgeport Park in Valencia. In addition to duck races throughout the day, the festival includes exhibitors, cool prizes, games, activities, food, entertainment, free admission and ample parking. Last year’s Rubber Ducky Regatta raised $30,000 that went directly to patient care at the nonprofit health care organization’s three health centers in Newhall, Canyon Country and Val Verde. The three centers provide approximately 11,000 visits annually, with charges based on the patient’s ability to pay. For more information and to adopt your ducks, visit http://www.sdfhc.org or call 661-257-2339 ext. 302 today. Samuel Dixon Family Health Centers, Inc. (SDFHC) announced that Boston Scientific returns as the top “Super Duck” sponsor for the 10th Rubber Ducky Festival by. All proceeds from the event will go toward patient care at SDFHC, which offers affordable, quality primary health care for residents of the Santa Clarita Valley. SDFHC makes a special effort to serve the uninsured and underinsured. “The employees at Boston Scientific share the mission of SDFHC, which is to help provide appropriate access to health care for those in need. I am honored to be chairman of this event, and look forward to continued collaboration,” said Matt Gunderman, Director of Health Economics at Boston Scientific’s Neuromodulation Division and chairman of the 2012 Rubber Ducky Festival committee. In addition to Boston Scientific’s title sponsorship, other sponsors include Providence Holy Cross Medical Center, Henry Mayo Newhall Memorial Hospital, SCV Rotary, Point of View Communications, Kaiser Permanente, C.A. Rasmussen, SOS Entertainment and Hands On Santa Clarita. Media sponsors include: Magazine of Santa Clarita, elite magazine, SCVTV, KHTS AM-1220, The Signal, Inside SCV, Smart Shopper, Santa Clarita Living, Canyon Country Magazine, Our Valleys Magazine, Edwards Outdoor Advertising. Special thanks extended to Andel Engineering. The Rubber Ducky Festival is set for Saturday, October 27, 11:00 a.m. to 3:00 p.m. at Bridgeport Park in Valenica. 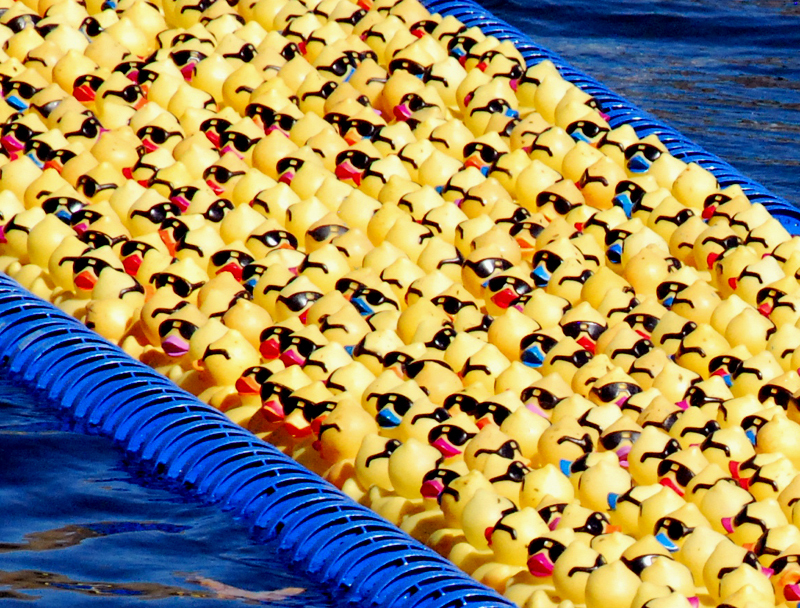 The fun-filled family festival features rubber ducky regatta races beginning at 12:00 p.m. In addition to games, activities and vendor booths, the event features food and entertainment. Los Angeles County Supervisor Michael Antonovich serves as this year’s Honorary Chairman. City of Santa Clarita Mayor Pro Tem Bob Kellar and Janice Murray, host of the Non-Profit Spotlight show on KHTS AM-1220, co-host the event as Masters of Ceremonies. CBS/KCAL news anchor Sandra Mitchell returns as the celebrity guest.